The Village of Kingham is located in the western border of Oxfordshire England, northwest from the Cities of Oxford and Woodstock, just southwest of Chipping Norton.Â Just recently a contest run by Country Life Magazine chose Kingham as â€œthe best place to live in rural Englandâ€�.Â This small Village with a population of 700 people,Â holds very special connections to the Wiggall Family. Richard and his sons also built the Village Hall.Â It is located just around the block from â€œWiggallâ€™s Cornerâ€�.Â The Village Cemetery is the burial spot for several member of Richardâ€™s Family.Â There are also three wrought iron benches in/or bordering the cemetery property that are dedicated to the Wiggall Family. Kingham Hill School is located about a mile out of the Village at the top of the hill.Â It is a very well known boarding school, located on 90Â acres of land overlooking the surrounding area.Â Richard Wiggall and his sons did all the stone mason work for the buildings on this gorgeous campus in the early 1900â€˜s. 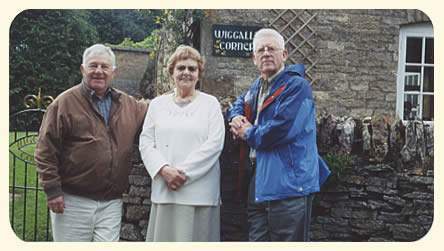 In March of 2002, a group of the Wiggle /Wiggill cousins from the USA took a trip to England and visited the school.Â Our photo was taken, placed on their website and in the local newspapers. In May of 2005, another group of the Wiggle / Wiggill cousins from the USA and Canada took a trip to England.Â A visit to the Kingham Hill School was a must on our agenda.